The Philips ShoqBox SB500 comes in a cardboard box following the shape of the speaker of which the contents are fairly limited: the box contains the SB500 unit itself, a small USB cable to charge the speaker, and the manual/getting started guides. Theoretically speaking it has everything that's essential for the product to function as it should, but I was surprised not to find a 3.5mm audio jack cable in there as well. Available both in blue and in orange, the ShoqBox is certain to stand out from its surroundings. The slick bar-shaped design with the bass boosters on the sides ensures that the sound of the speaker reaches in all directions. That said, it is pretty heavy and feels quite clunky to carry around for an extended period of time. When used in the dark, the SB500 features toggleable (Pattern 1, Pattern 2, Off) LED-lighting in many different colors, flickering on the beat of the music. The unit can be attached to different hooks/mount systems using a small loop on the side of the speaker. With an output power of 30W, 2x 2" speaker drivers, Bluetooth (A2DP, AVRCP, HFP) and 3.5mm audio jack support, IPX7-classification waterproofing, and a battery that lasts up to 8 hours, this is definitely a speaker that classifies above most other portable speakers in its category. The unit in itself has 230 x 105 x 101mm dimensions and weighs about 1kg. The speaker is shock resistant and feels very durable in terms of build quality. 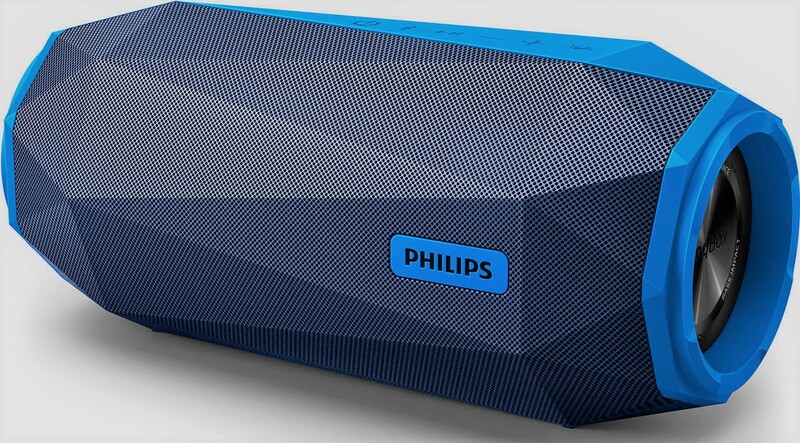 On Philips' website is claimed the speaker withstood multiple stress tests in their "torture chamber", and even though I don't know what those tests exactly entail, I am willing to believe them: we tested the SB500's waterproofing ourselves by submerging it into a swimming pool, and it kept doing its job just fine. On top of all the specifications one would want to know about a speaker like this one, the unit also has a built-in microphone enabling the user to have phone conversations through it. The SB500 has a very pleasant sound, with a prominent focus on bass that doesn't get too intrusive in non-bass heavy music either. The speaker was tested with multiple songs, and to test for a wide spectrum in sound, we put on Sail, by AWOLNATION. The speaker definitely packs a punch when it comes to volume: the warning symbols on the packaging don't lie. For the real party animals there is a "Shoq-mode" button, that immediately cranks up the sound to the loudest volume the speaker can handle. I think it's safe to say that this thing will definitely get you into trouble with your neighbours if you're uncareful. That said, there was a weird dependency of volume on the device the speaker was paired with: on the phone the volume was on the loud side, while on my laptop I had to put the sound setting quite high to reach the same volume level as the phone had. Something you might want to keep in mind if you want your speaker to have a consistent volume independent on the device that is streaming the music. I very much enjoy using the SB500 on a daily basis. The sound fits greatly with my music genre of choice, and the battery lasts long enough to not constantly have to bother with charging. However, I don't particularly see myself taking it around with me, as it isn't as portable as I would like. Another point of criticism lies in the range of the bluetooth: after only moving away a small 7m from the speaker, the connection started to get unstable. I also don't see great use for the built-in microphone, but that's dependent from person to person. Aside from those things, the speaker functions as promised, feels very durable and is a pleasure to listen to. The Philips ShoqBox SB500 is a very good choice for those that enjoy a good bass in their music, and want to be able to take their music with them on-the-go, not having to worry about weather or terrain. This bluetooth speaker can be yours for approximately 200 EUR. Because of its strong sound, good design and durable build quality, we award the product a BHTec Silver Award.